Using amazons apis capture the network interfaces with attachment.instance-owner-id for “amazon-elb”. For each network interface create a cloudwatch metric filter with the network interface. 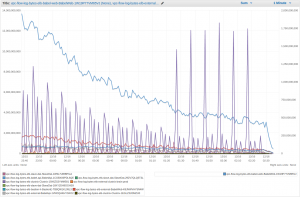 Running the above in a lambda function with a scheduled event every 5 minutes will create the relevant filters and cloudwatch logs. 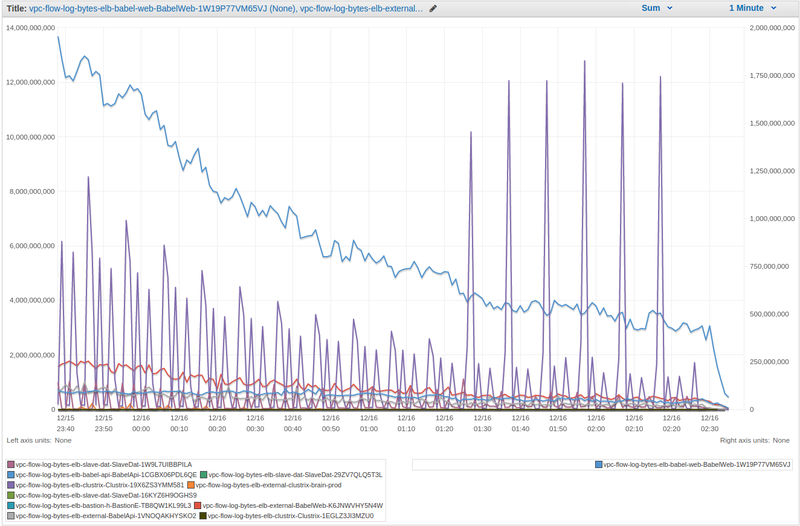 This takes the overhead out of analysing the VPC flow logs. Amazon ELBs rotate their servers and the attached ENIs will obviously rotate, so the second part is to identify whether the ENIs have been released and clean up. Amazon ELBs will add/remove nodes to/from DNS, which should be faster than a 5 minute period (the current minimum for a scheduled task). As such the time taken to start graphing new ENIs added to the ELBs will not be immediate. The above graphs should help us to infer an increase in network traffic through the ELB and to observe to set sensible alarms.